It surprised me even more (in a good way), when I saw a Math teacher starting to take advantage of the primarily thought of “blogging is about writing- hence for a writing class” platform. The Math teacher instinctively understood that blogging is not just about writing. It is about “presenting” your work, your thoughts and products to a large audience FOR feedback. Blogging is a platform that allows students to think about their Math work. In a previous blog post, Telling a Story with Data, you read about Laurel Janewicz‘ upgrade of her traditionally taught lesson of data analysis, graphing and misleading graphs. Laurel was also the teacher, you read about in Making Thinking Visible in Math regarding her work on metacognition in her sixth grade Math classroom. Students had created a presentation, analyzing and articulating a story of the data they had been presented, Part of the learning cycle was to share these presentations on their blogfolios. This could be accomplished by inserting images (screenshots) of their presentation with text, by embed a slidedeck, movie or other presentation platform with an embed code. Students were then assigned to look at, view and listen to 2-3 other classmates’ presentations. Keeping the rubric in mind, the teacher had distributed at the beginning of the project, students were to give “helpful” feedback beyond a short “Cool presentation” comment. At the beginning of class, Laurel gave students clear instructions regarding her expectations of quality comments. She stressed that feedback is designed to make a product better and it was meant to be addressed and responded to when someone had taken the time to leave it. What about the blog post title hooked you? Are there any suggestions you have for it? How did the presentation of the data keep you interested and engaged? What inferences can you make or what conclusions do you draw about the actual data that are different from the project creator’s? Think about all of the elements of the graphs, including the misleading ones: title, colors, axes titles, legends, readability. What comments do you have? Natasha, who graciously allowed me to use her image, demonstrated great presentation design and digital citizenship on her blog post,You can Never Go too deep When it Comes to Data , when she decided to take her own photo to match the topic of her blog post, instead of having to search for a Creative Commons or Public Domain one or infringe on copyright by using one she had goggled. I just think she does a great job of having the data tell a story in an engaging, interesting way. She is the first to have shared her project with me for feedback and I used it to share as an exemplar with classes. The title hooks me. Her analysis from different perspectives is quite good. Jack incorporates a student and parent interview as a way to provide their perspective of the data. Still surprised that a Math teacher is using blogging with her students? Learning how to read, write and communicate in different Media in Math is another puzzle piece in making Math more authentic and less abstract for students. Adding and amplifying an audience for students adds engagement and perspectives as well as improves quality of the work as it is transparently shared. Heidi Hayes Jacobs supports a more language based Math instructions with technology tools. She has also long advocated to teach Math as a foreign language. In an interview with Visual Thesaurus in 2010 she shares the importance of students to internalize Mathematical vocabulary and to be able to use them when one is speaking. “If Maria cannot say the words fraction, numerator, and denominator, then she certainly can’t read them, let alone carry out her fourth grade math assignment.” [...] Mary White from Harvard did a study on decibel levels in comparative levels of math classes in Japan and in our country, and they were significantly higher in Japanese math classes because they have kids speak out loud about what they’re doing. You can’t even ask a question about math if you can’t say the words, polynomial or fraction, for that matter, let alone read them. Using blogging as a pedagogy, as a method and practice of teaching, in the Math class supports Heidi’s claim of treating the teaching of Math as a World Language instruction. Get the students talking, communicating their ideas, receiving and giving feedback and having conversations…. about Math! 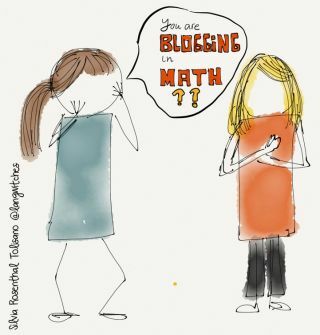 How are you using blogging in Math instruction? I am seeing the process of blogging unfold. I am seeing students being exposed to receiving and giving feedback.